Donald Trump, left, filed a complaint against New York Attorney General Eric Schneiderman for suing him and calling his university a "scam." Real estate mogul Donald Trump has filed a complaint against New York State Attorney General Eric Schneiderman, accusing him of misconduct. The complaint, filed Monday with the New York State Joint Commission on Public Ethics, accuses Schneiderman of soliciting donations from the Trump organization for his re-election campaign while investigating Trump University based on "a few isolated complaints" from former students. 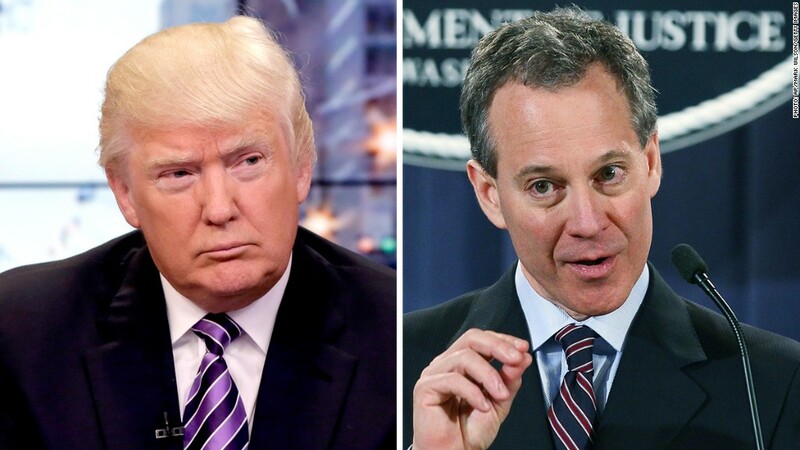 It also says that, when Schneiderman first sought the attorney general's office in 2010, he made at least two unannounced visits to the Trump Organization's offices, "at a time when his campaign was struggling," to personally request that Trump contribute to his campaign." Trump says he subsequently made a contribution of $12,500. The investigation into Trump University -- a real estate school -- began in 2011, shortly after Schneiderman was sworn into office. The Attorney General, who is up for re-election in 2014, filed a $40 million lawsuit against the school this past August, accusing it of fraud. "The lawsuit is nothing but a shakedown of a politically attractive target," reads the complaint. "Mr. Schneiderman commenced a defamatory, unstatesmanlike and, ultimately, jury-pool-poisoning media campaign to publicize the lawsuit." The lawsuit against Trump and his company is described in the document as "false, unsubstantiated, materially misleading, legally [and] deficient." "Donald Trump and his associates will say and do anything to avoid talking about the facts in this case. Mr. Trump's outlandish conspiracy theories and outright distortions will not distract Attorney General Schneiderman from pursuing justice for the students victimized by Mr. Trump and his scam university." Trump's complaint also objects to Schneiderman's characterization of Trump University as a "scam from top to bottom" and a "phony university with phony instructors." He also objected to Scheiderman's denigration of the school as a "bait and switch," a phrase that the New York Attorney General used during interviews on CNN. The complaint, dated Dec. 2, was provided to CNN by Trump's attorney, Jeffrey Goldman. Trump University has since been renamed the Trump Entrepreneur Initiative. --CNN's Rande Iaboni contributed to this story.